This statistic illustrates the results of a survey concerning the benefits and risks of anonymity online, which was conducted in France in February 2015. 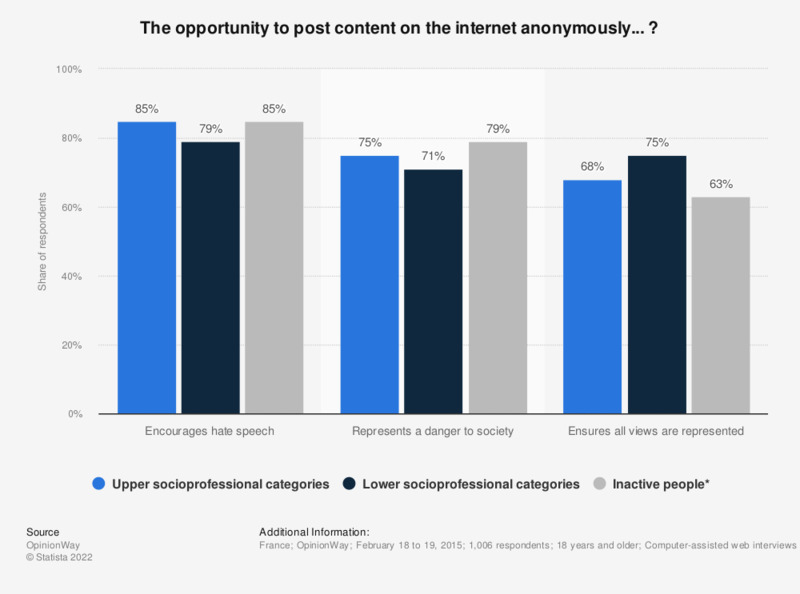 With regard to the socioprofessional category, it shows that 85 percent of upper socioprofessional categories and inactive people believed that the opportunity to post content on the internet anonymously encouraged hate speech. *Inactive people refers to people aged less than 15 years old, students, retirees, house wives and house husbands, persons unable to work. Shares correspond to respondents who fully or somewhat agreed with the statement. Statistics on "Antisemitism in Europe"
Do you think that denying the genocide of the Jewish people is a problem in your country?